Is the ʻAlalā more like a crow or a raven? 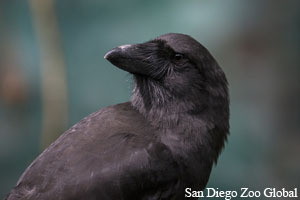 The ʻAlalā does look more like the Common Raven (Corvus corax) found in North America, although it is smaller in size. Research shows that its genetics are also closer to a raven, although more research is needed in this area. A member of the Corvid family (includes ravens, crows, magpies, jays), the ʻAlalā is thought to have colonized the islands several hundred thousand years ago and may be only distantly related to other crows. A study on the distribution, dispersal, and biogeography of Corvids shows that the ʻAlalā’s closest genetic relative is the Rook (Corvus frugilegus), which is native to Europe and Asia. To read more about this study, click here. There were nine genetic founders for the population that exists today. This small number of genetic founders has created a genetic “bottleneck,” and a result there is low genetic diversity in the population today. Read more about ʻAlalā genetics and genome sequencing on San Diego Zoo Global ZOONOOZ.